The People’s Republic of China has yet again pushed forth their militarisation of the South China Sea despite much objection from the United States and the countries involved, this time by sending fighter jets to a lengthened airfield on the contested Woody Island. 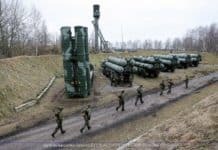 This development comes amid rising tensions after China set up eight HQ-9 advanced Surface-to-Air-Missile (SAM) systems on the Island last week, along with High-Frequency (HF) radar antennae on a reclaimed Cuarteron Reef in the Spratly chain on Monday. 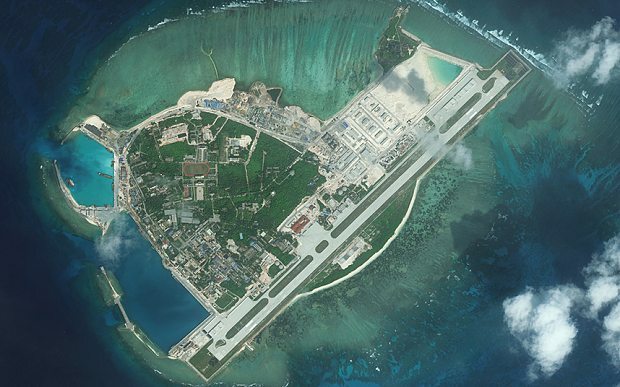 U.S. intelligence via satellite imagery has identified the aircraft deployed on Woody Island to be J-11 Flanker B single-seat fighters, and JH-7 Flounder twin-seat fighter-bombers from the People’s Liberation Army Air Force (PLAAF). The Shenyang J-11 is a licensed Chinese-built variant of the Sukhoi Su-27SK Flanker super-maneuverable fighter, with a maximum speed of Mach 2.35 (2,500km/h, 1,550mph) at altitude and an un-refueled range of 3,530km (2,193 miles). It comes with an internal 30x165mm auto-cannon with 150 rounds, along with 10 hardpoints – six of which are provisions for PL-8 short-range, heat-seeking and PL-12 Beyond-Visual-Range (BVR), active radar homing air-to-air missiles. The J-11 is China’s go-to 4th-Generation air superiority fighter, intended to compete against the F-15C (or F-15J) Eagle and F/A-18C Hornet aircraft. The Xi’an JH-7 is an indigenous Chinese-designed supersonic, maritime fighter-bomber that employs a tandem twin-seat cockpit, similar to that on the F-4 Phantom II. The Flounder has a maximum speed of Mach 1.75 (1,808km/h, 1,122mph) at altitude and an un-refueled range of 3,700km (1,970 miles). It features an internal 23x115mm auto-cannon with 300 rounds, and nine hardpoints – six of which are capable of carrying CM-802A and the C-70x series of anti-ship missiles, as well as an array of laser-guided Lei-Ting (LT) and GPS-guided Lei-Shi (LS) precision bombs. The JH-7 retains short-range air-to-air capability with PL-5, PL-8 and PL-9 infrared-guided missiles. Although the fighter-bomber has fallen victim to many failures (including a loss of rudder in-flight) and crashes during its testing phase, the JH-7 remains as China’s premier anti-ship aircraft, mainly intended to counter frigates, destroyers and missile cruisers that pose a threat to Chinese national interests and/or territory. Combined with the HF radar system in the Spratlys some 500km south of the Paracels, the fighters and SAMs create a strong Chinese military presence in the region, capable of monitoring and controlling the entirety of the South China Sea. 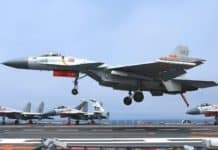 As things stand, China seems prepared to establish an Air Defense Identification Zone (ADIZ) in the South China Sea, which would allow Chinese forces to query, intercept and employ lethal force against any aircraft or vessel attempting to pass through the Zone, in the interest of national defence. U.S. Pacific Command Admiral Harry Harris said that “I am concerned about the possibility that China might declare an ADIZ… I’m concerned about it from the sense that I would find that to be destabilizing and provocative”. 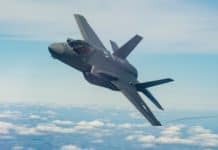 Chinese Defense Ministry spokesman Wu Qian told a monthly news briefing that “It is China’s legitimate right to deploy defense facilities within our own territory, no matter in the past or at present, no matter temporarily or permanently, no matter what equipment it is” and that the United States is employing double standards by not considering U.S. air and naval patrols to be militarisation. Wu said that “The United States is the real promoter of the militarization of the South China Sea”. China has already declared an ADIZ in the East China Sea over two years ago, which partly covers the disputed Senkaku (Diaoyu) Islands that fall under the administration of Japan. Both Japan and South Korea refuse to acknowledge the Zone. The People’s Liberation Army of China and the Japanese Self-Defense Force have a history of trading barbs with each other in the region, where both China and Japan claim to possess control over. 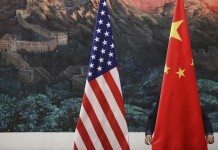 Admiral Harris spoke to the U.S. Senate Armed Services Committee on Tuesday, saying “If China continues to arm all of the bases they have reclaimed in the South China Sea, they will change the operational landscape in the region” and that “I believe China seeks hegemony in East Asia”. Bonnie Glaser, Senior Asia Advisor at the Center for Strategic and International Studies, says “Harris is raising alarm about what could happen if there’s not sufficient pushback, that’s what he’s trying to provoke here, a more robust response from the region and outside the region” and that “The U.S. cannot do this alone”. U.S. Defense Secretary Ashton Carter told the White House Appropriations Committee that “Chinese behavior is having the effect of self-isolation, and it’s also galvanizing others to take action against it”. He added that “Old allies, like Japan, South Korea, Australia and the Philippines, and then new partners, like Vietnam and India, that are working with us increasingly” and stepping up their maritime defence activities. Le Hai Binh, a Vietnamese foreign media spokesman told reporters that “Irrespective of the opposition and concern voiced by Vietnam and the international community, China continues to take actions that not only violate Vietnam’s sovereignty, accelerate militarization of the East Sea, but also threaten peace and stability,” referring to the South China Sea by its Vietnamese name. China heightened military challenge against US and allies in contested occupied island belonging to Philippines. China will never abandon the region rich in natural energy deposit as well control of international maritime and navigation and appear ready to go for war. Will Chinese made weapons can really upset the balance of power in Asia? 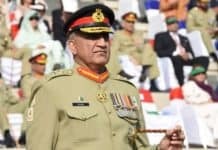 Why don't China as Asian dominant force show compassion and harmony to peaceful neighboring countries and portray himself as a model of peace rather than the aggressor? I think it's because China's leaders are too obsessed with their self-serving interests to show any such compassion. The central government does not even feel anything for the oppressed citizens in Hong Kong, much less other countries in the region.